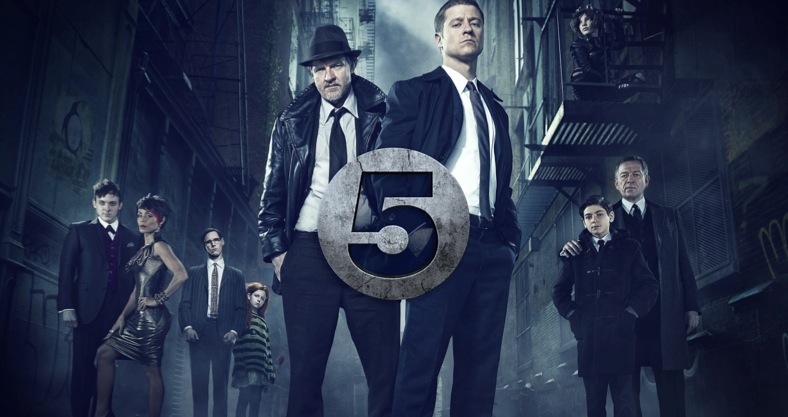 Gotham Gets a UK Premiere Date on Channel 5! Before there was Batman… there was Gotham, and Gotham will arrive in the UK – Monday 13th October at 9pm on Channel 5. If you want to know about the 1st episode, you can read our review here, but there’s also some more general info about the show below. It’s getting great reviews all around (and we loved it), so I urge you to tune in! Everyone knows the name Commissioner Gordon. He is one of the crime world’s greatest foes, a man whose reputation is synonymous with law and order. But what is known of Gordon’s story and his rise from rookie detective to Police Commissioner? What did it take to navigate the multiple layers of corruption that secretly ruled Gotham City, the spawning ground of the world’s most iconic villains? And what circumstances created them – the larger-than-life personas who would become Catwoman, The Penguin, The Riddler, Two-Face and The Joker? GOTHAM is the origin story of the great DC Comics Super-Villains and vigilantes, revealing an entirely new chapter that has never been told. From executive producer/writer Bruno Heller (The Mentalist, Rome), GOTHAM follows one cop’s rise through a dangerously corrupt city teetering between good and evil, and chronicles the birth of one of the most popular super heroes of our time. Starring Ben McKenzie (Southland, The O.C. ), Donal Logue (Sons of Anarchy, Vikings), Sean Pertwee (Elementary, Camelot), Robin Lord Taylor (The Walking Dead), Erin Richards (Being Human, Merlin), David Mazouz (Touch), Camren Bicondova, Zabryna Guevara (Burn Notice), Cory Michael Smith (Camp X-Ray, Olive Kitteridge), Victoria Cartagena (The Good Wife), Andrew Stewart-Jones (Person of Interest), John Doman (Mystic River, The Wire) and Jada Pinkett Smith (HawthoRNe, The Matrix films), the series — from Warner Bros. Television — will be shown exclusively on Channel 5. Growing up in Gotham City’s surrounding suburbs, James Gordon (Ben McKenzie) romanticized the city as a glamorous and exciting metropolis where his late father once served as a successful district attorney. Now, two weeks into his new job as a Gotham City detective and engaged to his beloved fiancée, Barbara Kean (Erin Richards), Gordon is living his dream – even as he hopes to restore the city back to the pure version he remembers it was as a kid. Brave, honest and ready to prove himself, the newly-minted detective is partnered with the brash, but shrewd police legend Harvey Bullock (Donal Logue), as the two stumble upon the city’s highest-profile case ever: the murder of local billionaires Thomas and Martha Wayne. At the scene of the crime, Gordon meets the sole survivor: the Waynes’ hauntingly intense 12-year-old son, Bruce (David Mazouz), toward whom the young detective feels an inexplicable kinship. Moved by the boy’s profound loss, Gordon vows to catch the killer. As he navigates the often-underhanded politics of Gotham’s criminal justice system, Gordon will confront imposing gang boss Fish Mooney (Jada Pinkett Smith), mob kingpin Carmine Falcone (John Doman) and many of the characters who will become some of fiction’s most renowned, enduring villains, including a teenaged Selina Kyle/the future Catwoman (acting newcomer Camren Bicondova), Oswald Cobblepot/The Penguin (Robin Lord Taylor) and Edward Nygma/the future Riddler (newcomer Cory Michael Smith). The crime drama will follow Gordon’s turbulent and singular rise through the Gotham City police department, led by Police Captain Sarah Essen (Zabryna Guevara), as he goes head-to-head with Major Crimes unit detectives Renee Montoya (Victoria Cartagena) and Crispus Allen (Andrew Stewart-Jones). It also will focus on the unlikely friendship Gordon forms with the young heir to the Wayne fortune, who is being raised by his unflappable butler, Alfred Pennyworth (Sean Pertwee). It is a friendship that will last them all of their lives, playing a crucial role in helping the young boy eventually become the crusader he’s destined to be. GOTHAM is based upon the characters from DC Comics and is produced by Warner Bros. Television. Executive producer Bruno Heller wrote the pilot, which was directed and executive-produced by Emmy® nominee Danny Cannon (Nikita, the “CSI” franchise). John Stephens (Gilmore Girls, Gossip Girl) will serve as an executive producer on the series distributed worldwide by Warner Bros. International Television Distribution. ← Which is better: The Android L or the Apples’ New Operating System? Actually Gotham premieres on Monday 13th October at 9pm. NOOOOOO! I have to choose between The Walking Dead and Gotham?? ?